Would the gender plane equalize if men or women had the option to gestate a child via artificial womb? The work is meant to raise this hypothetical question. The hair loss experienced after giving birth also alludes to the many other losses women often surrender after becoming mothers. From the artist's own body, gelatin molds are created with breast milk simulating the blocked flow flow (also referred to ‘loosing mother’s milk’) often caused from the stress of going back to work too soon after giving birth. Traditional domestic tasks, such as laundry and sewing, have historically been assigned, assumed, and assimilated to "women's work." Here, the artist satirizes the stereotype of the "wife-mother-maid" archetype by creating a conventional maid’s blouse as a reference to hysteria associated to the hyperfeminine roles women have had to accept throughout history. Baby stool markings document how many times the artist changed diapers daily---another domestic duty as a new mother performed around the clock during her UNPAID maternity leave. Using her own body, the artist created an accurate documentation of the amount of times she breastfed her newborn baby in every day. Relational Sustainability is an interactive installation in which gallery visitors are encouraged to assume a role within the immediate ecosystem by sending a tweet---each tweet triggers a pump that feeds the plants water to change their fate from drought. From digital clouds to weather in our atmosphere, the connection is created between data and water molecules. 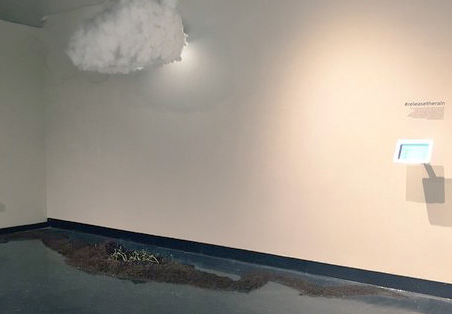 This installation investigates weather and the significance of intentionality in human’s efforts to remediate pressing anthropogenic problems, such as drought. 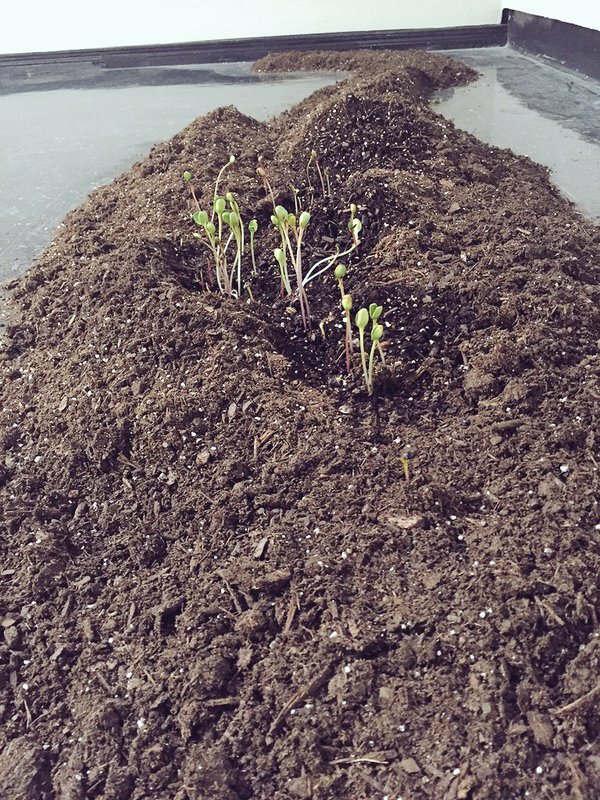 Preoccupied with the notion of intervention, this experimental project examines the relationship we have with our environment. Here, the artificial systems assist the natural systems to propagate as a reflection of our own intimate consciousness with technology. This installation deals with drought within the cultural context of the borderland region. In this piece, the tumbleweed is painted in festive “Day of the Dead” Mexican colors among dry riverbank vegetation as an allegory to the artificial and natural process of cultural assimilation on both sides of the U.S.-Mexico border. Here, native Rio Grande tumbleweed is taken out of context---both in color and placement---to the middle of busy New York City streets. Tumbleweed has a turbulent life, which in this setting is the perfect allegory for the current notion of migration and immigration that greatly affects our unique cultural landscape. Raw clay slakes were harvested from the dry riverbed of the southern Rio Grande river. The clay was processed and vessels molded from the clay. Afterward, the clay vessels are placed back in the dry riverbed----their source of origin--- as they “wait for rain" to come to the arid region. The clay vessels acted as a kind of poetic “offering” in bringing rain to the region. The paper map airplanes depict the border region along the Rio Grande River that divides the United States and Mexico. Paper airplanes made out of U.S.-Mexican border maps present a satirical perspective at the attempt of building harsh divides between the neighboring nations. River Walk is a recording and collection of findings gathered during the artist's walks in the dry riverbed of the Rio Grande as she journeyed southbound from Texas toward Mexico---her birthplace. For this piece, the viewer is encouraged to paint the missing water onto the image of the Rio Grande River. By using a brush to apply water directly on dry clay tiles made from harvested river clay, the participant can add as little or as much water as they think the river scene requires.